250 Pre-University students were recently part of a seminar titled “A gift from nature, a gift for life” seminar that was conducted by the Malaysian Palm Oil Council (MPOC), held to create awareness amongst students to understand the oil palm industry which is an integral part of the Malaysian economic growth. Faudzy Asrafudeen, Director of Marketing and Market Development, MPOC delivered the keynote address on the history of the palm oil industry and how it has developed to what it is today. He, together with other speakers from the industry enlightened the students on the scope and environmental impact surrounding the palm oil industry. Elizabeth Lee presenting Faudzy Asrafudeen with a token of appreciation. The seminar featured two segments; an environmental talk and a nutritional talk. The environmental talk included a short seminar on environmental concerns and practices by the palm oil industry including conservation related issues. Students were encouraged to participate in an open forum with environmentalist experts and discuss environmental issued concerning palm oil which mattered most to them. They also learnt about the environmental position of other oil seed crop producing countries such as Canada and Europe and how they are facing environmental challenges in those regions. Through the seminar they also learnt real world issues surrounding environmental policies in the palm oil industry in countries such as Australia, New Zealand and the United States and how they affect the global outlook for the commodity. Jyunichi Washizaki presenting a talk during the “A gift from nature, a gift for life”seminar held at Sunway College recently. The nutritional talk focused on the technical usage and application of palm oil and its advantages in comparison with other oils in comparison to its nutrition, taste and practical usage. Different cooking techniques like frying and baking were also demonstrated. Raymond De Gracious presenting his talk to the Sunway College students. Among the speakers present were Mohd Muslimin Bin Hashim, Manager of the Science & Environment Division, MPOC; Jyunichi Washizaki, Technical Programme Officer at Wild Asia; Raymond De Gracious, Head the new Employee Engagement and Employee Branding Unit under the Human Resource Department of Sime Darby Plantation and Dr Diana Ramirez, Veterinarian from the Sabah Wildlife Department. Sunway College’s Australian University Programme (AUP) which offers the VU Bachelor of Business degree held the inaugural ‘VU Business Challenge’ event recently. Sim Yi Qi from Chong Hwa Independent High School, KL emerged champion while Wong Jun Ren also from Chong Hwa Independent High School, KL emerged first runner-up. Second runner-up, Ng Eu Ee is from Hin Hua High School, Klang. 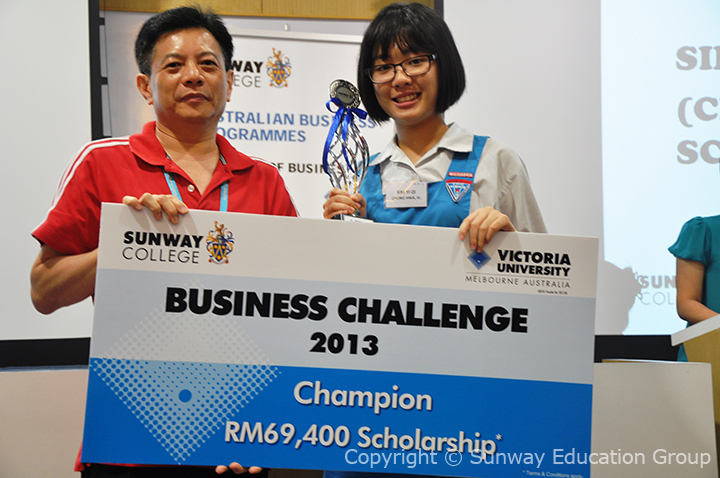 Yi Qi walked away with a full scholarship, amounting to RM 69,400 to pursue the three-year VU Bachelor of Business degree programme at Sunway College and the VU Business Challenge 2013 trophy. Runners-up, Wong Jun Ren and Ng Eu Ee were both awarded scholarships amounting to RM 24,000 and RM 15,000 respectively and a trophy to also pursue the VU Bachelor of Business degree programme at Sunway College. Sim Yi Qi holding the winning trophy and mock cheque with Teo Ee Sing, Executive Director of Sunway College. Lee Boon Quan, a Sunway Australian Matriculation Programme (AUSMAT) alumnus is currently attached to the Department of Nuclear Physics in the Australian National University (ANU). 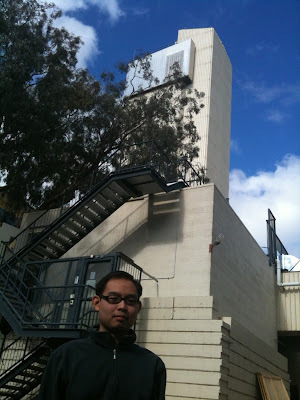 Lee Boon Quan standing in front of the Department of Nuclear Physics in the Australian National University (ANU).